This fun-loving ‘designer’ dog is a mixed breed dog and is a cross between the Yorkshire terrier and the Poodle. The most common given name for this dog is Yorkipoo sometimes spelled Yorkie-Poo. A kind and loving dog, it is perfect for those who want a dog that will not require too much grooming or care. This hybrid dog was first designed with the intention of being a companion dog that was able to live with those people suffering from allergies as it is a low-shedding dog. The coat of the Yorkipoo is generally softer than most dogs with a slight curl or wave which it inherits from its Poodle parent. This dog comes in a variety of colors which include black, silver, white, grey, tan and even apricot. The ears can either resemble the Yorkshire terrier or the Poodle depending on the content percentage of the dog. This active and fun-loving dog is a yappy dog and it tends to bark a lot especially when it is enjoying itself as it can get a little overexcited at times. It loves being in the company of humans and relishes the attention it gets. This dog is the perfect companion dog as it stays loyal and loves to participate in everyday family life. This dog is happiest when sitting close to its owner, often on its lap watching the world go by. It is a curious dog and likes to go exploring which is why owners need to watch it carefully as its small size means that it can get lost easily. It is important to socialize this dog from an early age to ensure that your puppy turns into a well-rounded dog. The size of the Yorkipoo can differ between the individual dogs, however, these dogs typically weigh between 3-14lbs (1.3-6.3kg) and measure 7-15 inches (17.7-38cm) in height when full-grown. This dog is generally much healthier due to being crossbreeding however, you must check with reputable breeders before buying one as over-breeding has the tendency to cause illness. Like smaller dogs the Yorkipoo could develop Legg-Calve-Perthes disease which is a hip joint deformity common among smaller breeds and if a dog develops this, it can be corrected with surgery. Like the Poodle, the Yorkipoo can also experience hip dysplasia. If cared for properly the Yorkipoo life expectancy is 15 years. The Yorkshire Terrier Poodle mix is an adaptable dog and can live in most conditions indoors. Because of its size it is ideal if it lives in an apartment as long as it is walked and exercised on a daily basis. 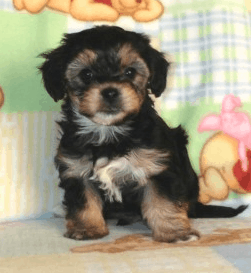 If the owners choose to crate train their Yorkipoo puppy, they should never leave the dog inside for over 2 hours as it can cause the dog to suffer from depression which will in turn hinder the training process. This dog is way too small to keep outdoors and it needs to have an environment with a controlled temperature. Yorkipoos do not require too much exercise and it is sufficient to allow it outside for a walk each day for about 20 minutes. If they are played with regularly, it is enough for them to burn off their energy. Although this dog is considered to be a non-shedder it still needs it hair brushing to keep it tangle-free and looking shiny. Yorkipoos tend to have longer hair around the eyes and it should be brushed away from the dog’s eyes or trimmed to prevent the eyes being irritated and infected. This is a non-shedding dog and it is perfect for those who suffer from allergies. This dog loves to be part of a family so it would suit a family of 3 or more members to ensure it gets all the attention it craves.